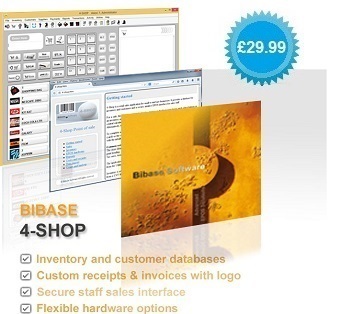 4-Shop is the right answer for any small or mid size business that needs to do retail sales. It is a general point of sale application for retail outlets that has been specifically designed for ease of use. Most EPOS hardware supported with easy configuration. Secure sales interface that staff will be able to use in minutes. Suitable for general retail, convenience stores, Take away, restaurants, sports and trade counters. (For Windows XP, please see our similar product, 4POS Retail). Display 1024 by 768 or greater. A wide variety of single click reports are available. The F12 key pulls up an overview of the most useful daily information. The program can also produce sales summaries, restock lists and comprehensive logs of all transactions. Non inventory sales, sale age alerts, inventory expiry option, buy one get one free facility, inventory and customer CSV and XML export, trade price toggle, direct 4POS inventory import option, no midnight use limitation, full screen mode. Android inventory viewer utility. Just copy the inventory file, inventory.dat, to the device and import it. £29.99 Includes CD and shipping. Does the CD include the manual? Yes, it includes the manual in electronic form. We accept card or Paypal. The checkout page is secure operated by Paypal. All prices include free worldwide shipping by Royal Mail.